Just an hour from both Limoges and Poitiers with their cheap flights, or 5-7 hours drive from the French ports the cottage is reached down a narrow farm lane. It has a fully enclosed and secure garden, with an above ground pool, a lovely terrace, trampoline, hammocks and a BBQ. Inside there is spacious accommodation with beamed ceilings and tiled floors. Full central heating and a wood-burning stove, fully fitted kitchen, 2 double and a twin bedroom, 2 shower-rooms and a mezzanine sitting area with TV, UK Satellite and DVD, wireless broadband. There is plenty of space on the mezzanine for extra sleeping. The local village has 2 boulangeries, a bank and a Spar supermarket. There is a great restaurant just across the river from the cottage. You will find some lovely walks and cycle rides; fishing and water sports on nearby lakes and rivers, horse-riding and some charming medieval towns to explore. "This was the perfect location for us to get in some much needed relaxation. It is such a peaceful place and yet there is plenty to keep the kids happy too. We all enjoyed the pool and lying in the hammocks and admiring the many beautiful trees. This is a very well-equipped holiday home and the upstairs bedroom and mezzanine lovely spaces to hang out in." "We had one of the best holiday experiences in France that I can remember for a long time - and that goes back 40+ years!" I live in the the South of England with my husband, 2 kids and our dog. We bought our lovely cottage so we could have somewhere for holidays and be able to take our newly acquired puppy. We wanted somewhere far enough south to get good weather in the summer, but near enough so we could drive in a (long) day from home. We also wanted somewhere near to airports so we have the option to fly for short trips. It has been a real joy. We have had great summers there playing in the garden and in the pool; larking about on the hammocks; cycling and visiting some charming towns and villages. We also love it in the winter, curling up beside the log burner after a chilly walk by the river, or watching some great DVDs. I love just lying in a hammock with a book and a glass of wine! And of course it's great discovering new restaurants, markets and shops. The kids love having a big garden, the trampoline to bounce on and a pool to play in. They like having empty roads to cycle along, swimming in the river and going horse riding. The dog likes new walks and a garden to sniff around. My husband just likes to potter and fix his bikes! And all our guests seem to think Chez Bobin is as magical as we do, judging from the great comments in our visitors book. En-suite to bedroom 1 with loo, basin, large shower. Shower room. Separate loo. This is a rural location and internet connection is patchy. We do not recommend it for anyone who needs to stream data, or needs to work from the house with fast internet connection. Sitting/dining room, wood-burning stove, sofa, large table and chairs, plenty of toys, games, jigsaws and telephone. There is a sofa bed and TV/DVD/BluRay in the mezzanine area. All the basic store cupboard food is in the house, plus loo rolls, washing up liquid etc. Fully fitted with plenty of cooking equipment. Eye level fan oven, gas hob, large fridge/freezer, microwave, toaster, table and chairs, and a high chair. Notes on accommodation: Full central heating, so the house is really warm in the winter. There is a steep staircase to the first floor, but we have a toddlers stairgate at the bottom. Well behaved dogs are welcome. Outside: An 18ft circular above ground swimming pool with lockable steps. Large table and chairs for 10 on the terrace. Sun loungers and concrete BBQ. Two hammocks. A large trampoline in the garden, suitable for kids over 6. There is a large garage with bikes for visitors use. Utility Room: Separate laundry building with washing machine, tumble drier, iron and ironing board. Cleaning / Towels / Linen / Maid service: Linen and towels included. Cleaning at end of stay included. Other: Mezzannine sitting area with Satellite TV/DVD/BluRay and lots of DVDs. We also have wireless broadband internet connection if you bring a laptop, an internet radio and iPod dock. There's a sofa bed, and separate single fold up bed. 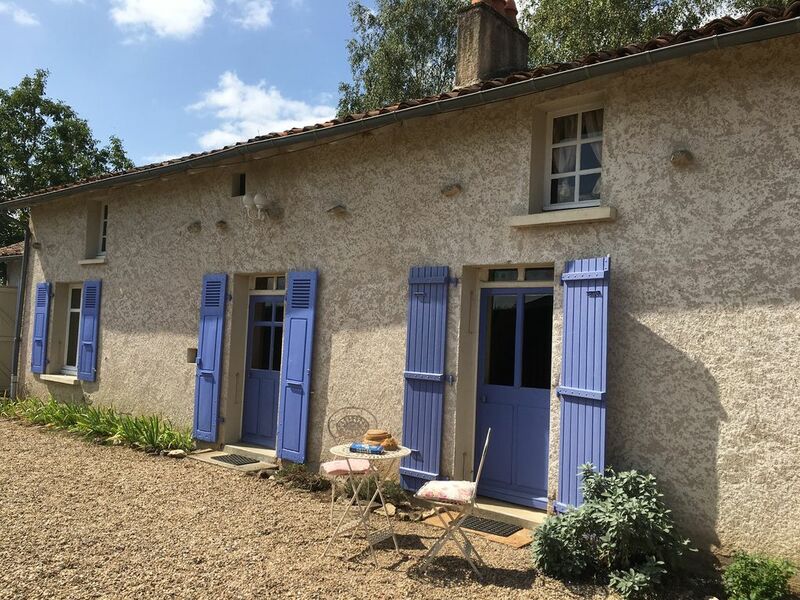 We stayed in Chez Bobin in February 2019, the house is extremely comfortable, well equipped and in a lovely countryside location yet handy for amenities. The beds are comfortable, 3 bedrooms, and the luxury of two public rooms makes it so easy on everyone. We found that the wi-fi was excellent as was the Sky setup, it actually worked well, Spain last year was a joke! If in doubt just do it you won't be disappointed, this is a lovely place in a lovely area, we did not of course have use of the pool but it looked nice and the garden is spacious, I could see myself on a hammock in the summer, slung beneath the birch trees waiting for a bit of charred something off the barbeque. We stayed in Che Bobbin for one week over the summer holidays and had an enjoyable stay. The kids loved the pool and trampoline and the dogs loved all the smells and lizards in the garden. The back garden was perfect for relaxing in the evening with a glass of local rose wine and cheese. The house is perfectly situated for kayaking in the river, visit to the crocodile farm (a highlight for my 6 year old) and interesting villages. The only downside was that the wifi wasn't working so well. Particularly loved relaxing in the hammocks. Very comfortable house with plenty of room for everyone to do their own thing. Plenty of local walks to enjoy and the walks at Roc d'Enfer & Saut de la Brame are very special. Local activity centre very well organised & offers range of exciting things to do. So many places to visit within an hour's drive. Thanks Sue - so glad you enjoyed it. Wonderful holiday home with all the comforts one needs for a cosy winter break in France. Very easy to find and in a beautiful location. The house was warm and easy to live in with an efficient wood burner for chilly winter days. The kitchen is well equiped, the bathrooms were clean. The bedrooms and beds very comfortable. It is also very dog and child friendly and in a great position for visiting local towns. There are some lovely walks right on the door step and a couple of wonderful restaurants along the local river. We have at Chez Bobin three times so far, twice in the winter and once in the summer and I can happily say it has never disappointed. I highly recommend this cottage. Thank you! We love it there too. Escape from our hassled lives. Chez Bobin is in a quiet hamlet, but not so far from bread,markets, good restaurants and great days out. When you are at Chez Bobin you feel the peace. Wonderful countryside with wild flowers, good walks, toads croaking , stars, oh the stars. Swim in the pool, lie in the hammocks and read a book , just watch the birds, even a hoopoe on the lawn. We will remember Roc D'enfur , a walk away, for the river, the picnic and sipping wine on a rock. We loved the garden , perfect for long meals outside. Markets locally are superb, cheese to remember. Chez Bobin is well equipped for singles to families. It is a loved family home. If you love countryside or just need a hassle free break Chez Bobin is perfect. We cannot wait to return. There are several lake beaches in the area. Lake St Pardoux is about 45 minutes away - it has a lovely sandy beach, safe swimming and lots of water sports. In the summer there is plenty of swimming in the river 5 minutes away. Ryanair fly from Stansted to Poitiers and Limoges which are both about an hour away. They also fly from Liverpool and Birmingham to Limoges. Flybe fly from Southampton to Limoges. Ryanair often have cheaper flights to Tours, which is about 2 hours away. The cottage is about 6 hours from Calais, and about 5 from Dieppe and Le Havre. The nearest village, Lathus St Remy is about 5 minutes drive. Montmorillon, 20 mintues away, is delightful with lots of restaurants, cafes, a market and plenty of activities for adults and children. There a 12th century church, Octagon and Monastry and the world famous Macaroon Museum. The old towns of Bellac, Le Dorat, Chauvigny and Le Blanc are all near, with lots to explore and discover. Futuroscope - a 21st Century attraction park devoted to films and images - is less than an hour away; so is a Monkey Sanctuary and a Reptile Centre. The monthly market at Les Herolles is the largest in the region and well worth a visit. As is the velo-rail at Chavingny where you 'cycle' along an old railway track 8km into the countryside and back. Bungee jumping, micro-lighting, motor racing and 4x4 off roading are all available close by. Booking Notes: Deposit not refundable Changeover Day: Departure day is usually Saturday, but other days can be discussed. Notes on prices: Prices include linen, towels and cleaning. There is a small extra charge for dogs. Price negotiable for long winter lets.